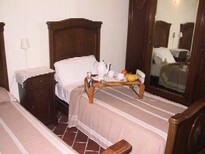 Welcome to the Residence La Gaggianese in the town of Rosate, MILAN. The residence, immersed in the agricultural park South of Milan, was designed and built in an old but renovated Lombard farmhouse. 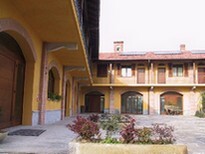 The building stands in a rural and quiet context, the external and internal restructuring was undertaken in full compliance with the architectural traditions of Lombardy. Along with fine finishes such as tile floors and ceilings with exposed beams, the apartments are spread over a balcony railing of a classical framing the typical cottage country developed an L.
The large courtyard is paved with old beola recovered by river stones placed in the frame. The Residence offers its guests a combination of elegant rustic atmosphere combined with modern facilities to make them a pleasant and relaxing stay. The structure is composed of several studios which vary in size and furnishings and can accommodate one to four people each. Each apartment is fully furnished and equipped, furnished with comfortable fully equipped kitchen, private bath, satellite color TV and air conditioning.